Half wave dipole antennas are typically used for site attenuation measurments, shielding effectivness and as a gain reference antenna. 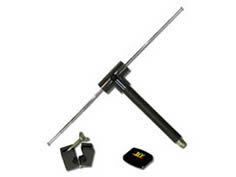 They are the simplest and widely used class of antennas. The tunded dipole antenna consists of two quarter-wavelength telescoping elements placed end to end for a total length of approximately L = Lambda/2. This is the proper adjustment procedure for the dipole antenna series and the resonant frequency/element length chart. To use your tuned dipole antenna, you must set them up either on a tripod for informal testing or on an antenna mast for site attenuation and/or compliance testing. The telescoping elements should be adjusted to the resonant frequency (1/2 wavelength). When adjusting the elements make sure that the largest OD is exposed.